We hope you enjoyed the first episode. If you haven’t listened to it yet then what are you doing reading this? You must not like hearing things. Oh well. If you feel brave, head over to the Episodes category. 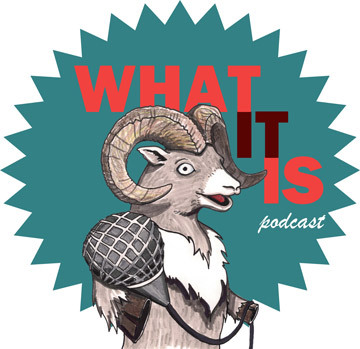 We were really happy to finally get the ball rolling on ‘What It Is’. It has been a brain child of Chris Cook and I’s for the past few months so it’s been very rewarding to see it come to fruition. But, the first pass is not always the strongest. We had a few sound issues which we have fixed for future episodes. So, don’t worry your pretty little head that some voices were louder than others. We know. We heard the episode too. We want to hear from you so please connect with us! Here. On facebook, twitter or email. If you have any constructive or explosive criticism go ahead and share it! We won’t take offence unless you intentionally offend us. So, just maybe…don’t do that, okay? Thanks for listening. We do this for you. Look for our next episode in 2 weeks!